In recent years, oil and grease has been identified as an emerging pollutant of concern (EPC) in wastewater stream as it can disturb the ecology and wastewater treatment process efficiency. The highest contributor to oily wastewater among domestic wastewater is from kitchen greywater. One of the alternatives to address this problem is the application of enzyme. The production of enzyme by using organic waste has gained significant attention in the recent years due to sustainable demand from it. In this study, pectinolytic enzyme was produced through simplified fermentation from discarded citrus peels that possess high lipase content. Three batches of treatment which consist of the control sample (solely wastewater), 25% (v/v) citrus enzyme + wastewater and 50% (v/v) citrus enzyme + wastewater was incubated in an incubator shaker for 10 days at 30 °C and 150 rpm. The wastewater analysis was performed at a regular interval of 48 h. The parameters monitored were pH, BOD5 and oil and grease. Laboratory work has demonstrated that 25% (v/v) pectinolytic enzyme was able to remove BOD5 and oil and grease about 10% better than 50% (v/v) pectinolytic enzyme. The percentage of removal achieved by 25% (v/v) pectinolytic enzyme was 39.83 ± 9.50 mg/L and 64.21 ± 1.12 mg/L, respectively. However, it was observed that enzyme was less effective in removing BOD5 as the solution contains organic matter that increases the total organic matter in the wastewater mixture. Oil and grease pollutant has been identified as an emerging pollutant of concern (EPC) in wastewater stream due to the increase in percentage composition in sewerage stream that jeopardize the ecology and damage the equipment used in the wastewater treatment plants (Jameel et al. 2011). In addition, the volume of oily wastewater released from restaurants and other commercial food services differs greatly from the residential kitchen wastewater, especially during the peak operating hours of the business. The presence of oil and grease in the wastewater stream can cause blockage in pumps, screens, sewers and filter distributor arm which eventually hinder the treatment processes and increase the maintenance fee (Fulazzaky and Omar 2012). Oil and grease, which is also known as brown grease, is the by-product of cooking (Husain et al. 2014). It can be solid or a viscous liquid depending on the saturation of the carbon chain (Kamaruddin et al. 2017, 2018). Oil and grease which consist of triglyceride as the chemical structure are a subsection of lipids. It is made up of lipid-soluble hydrocarbons, and three fatty acids bonded with glycerol, which is an alcohol with three carbon atoms, of each carrying a hydroxyl group (HOCH2CH(OH)CH2OH) (Dehghani et al. 2014). Fatty acids are carboxylic acids with long-chain hydrocarbon side groups. They usually occur in esterified form as the main components of lipids. Oil and grease are a complex mixture of triglycerides, in which their fatty acid composition differs based on the origin of the organism. Plant oils are usually liquids at room temperature as they are richer in unsaturated fatty acid residues (Gunstone 2009). Natural oils have low solubility in water with high tendency in dissolving in organic solvents, such as hexane (Dehghani et al. 2014). Lipids, characterized as oils, greases, fats or long-chain fatty acids, are major organic component of domestic wastewater, and their removal is a main concern in wastewater treatment (Jameel et al. 2011; Beldean-Galea et al. 2013). Among all greywater streams, kitchen greywater contributed to the most concentration of oil and grease (Friedler 2004; Mohamed et al. 2013). Generally, oil and grease are introduced into the sewer system either by direct pumping into the system or by escape from grease traps that are normally installed in commercial food services. The grease traps separate oil and grease from the effluent before it reaches the sewer pipe (Aziz et al. 2010). Furthermore, if high-temperature water is involved in the cleaning and poured into the sink, oil and grease may emulsify with the wastewater and thus escape from the grease trap. Hence, oil and grease that flows into the wastewater stream may solidify and form deposit on the surface of the pipe, damaging the sewer pipes and pumps in terms of physical blockage (Keener et al. 2008; He et al. 2011; Fulazzaky and Omar 2012; He et al. 2013; Husain et al. 2014). Typically, conventional methods are mostly used to remove the oil and grease in the kitchen greywater stream; it can be performed by installing skimming tanks, whereby oil and grease will be trapped in this system (Fulazzaky and Omar 2012). Only concentrated waster could pass the skimmer. Retained lumps will be skimmed and removed for disposal. However, there is drawback of this system due to its low efficiency of removal (Abd El-Gawad 2014). In recent years, enzymes have gained attention as an alternative due to its cleaner production (Leal et al. 2006). 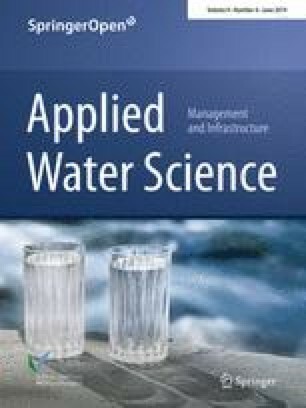 Many methods have been utilized to remove oil and grease in wastewater streams, including floatation, gravitational methods, chemical treatment, biological treatment, dissolved air floatation, adsorption and the use of membranes (Rubio et al. 2002; Chowdhury et al. 2006; Okiel et al. 2011). However, some of these methods involve high capital investment, skillful labor and high energy consumption. Table 1 simplifies typical kitchen wastewater parameters concentration from various sources. Generally, BOD, COD, oil and grease and suspended solids (SS) made up major wastewater constituents that need to be addressed before discharging it into the receiving streams as it has higher impurities. Oil and grease, subsection of lipids, is a major organic matter present in kitchen greywater that can cause environmental pollution, such as sanitary sewer overflow due to blockage of sewer pipe. Besides, it causes unpleasant odor and attracts pests (Husain et al. 2014). Therefore, it requires a hefty fund for the maintenance and clearance fee. There are several methods to remove oil and grease from the greywater, and one of them is by using enzyme (Kamaruddin et al. 2015). Normally, enzymes are used in the treatment of wastewater origins from biological additives. For example, laccase has been widely used in wastewater treatment systems to treat specific pollutants targeting wastewater-rich lipids and fats (Tan and Tong 2011). Others, pancreatic lipase have been used for hydrolysis and to reduce the size of fat particles in slaughterhouse wastewater (Cammarota and Freire 2006) and dairy industries (Masse et al. 2001). Nevertheless, purchasing pure enzyme for treatment is not economical to small-scale food businesses and household; thus, an alternative and cheaper source of enzyme is needed. One of the promising methods is to obtain enzyme from fermented of organic waste that contains high pectinolytic attributes. Recently, garbage enzyme has been studied to treat greywater and industrial activated sludge (Tan and Tong 2011; Nazim and Meera 2013; Arun and Sivashanmugam 2015; Nazim and Meera 2017). However, there is very limited information nor documented reports have been established on the feasibility of using citrus and fruit peels wastes through simplified fermentation for the removing of BOD5 and oil and grease from the kitchen greywater. Thus, this study is proposed to fill the gap of knowledge on the method of sustainable pectinolytic enzymes production that able to remove selected wastewater pollutant to permissible limit stipulated in the Environmental Quality (Industrial Effluent) Regulations 2009 [PU (A) 434], Department of Environment Malaysia. Pectinolytic substance is the generic name used for the compounds that are acted upon by the pectinolytic enzymes. They have been known with high molecular weight, negatively charged, acidic, complex glycosidic macromolecules (polysaccharides) within the plant kingdom (Jayani et al. 2005). They present as the main components of mid-lamella between the cells in the form of calcium pectate and magnesium pectate. Typically, the middle lamella is mostly composed of pectic compounds, with higher uptake of ruthenium red which identified as pectic substances and from the estimation of pectin by the use of alkaline hydroxylamine, respectively. The goal of this work is to synthesize pectinolytic enzyme from citrus peels and Musa acuminata peels for BOD5 and oil and grease removal from kitchen greywater by batch protocol. Sustainable approach in this work was profound in terms of preparation of the enzymes which procured from waste resources. Meanwhile, the efficient reduction in BOD5 and oil and grease was extensively studied. Fruit waste was collected for the preparation of pectinolytic enzyme. The fermentation process was done in airtight plastic container, and the duration was fixed at 90 days long. The fruit peels were mixed with brown sugar and distilled water in a ratio of 1:3:10 of brown sugar/fruit waste/distilled water (Poey Keat 2011; Tan and Tong 2011; Nazim and Meera 2013; Othman 2013; Arun and Sivashanmugam 2015, 2017). In this study, 1500 g of equally mixed citrus peels and Musa acuminata peels were mixed with 500 g of brown sugar and 5000 g of distilled water. The selection of these peels was according to the pectin content as proposed by Jayani et al. (2005). Ideally, some other pectin contents for selected fruit wastes are shown in Table 2. The wastewater samples were divided into three sets: the control (wastewater sample), wastewater sample + 25% (v/v) pectinolytic enzyme and wastewater sample + 50% (v/v) pectinolytic enzyme. For the first set, which is the control, wastewater sample was added into five portions of 250-mL Erlenmeyer flasks, 180 mL wastewater sample each. For the second set, 180 mL wastewater sample was added into five portions of 250-mL Erlenmeyer flask each, followed by 25% (v/v) pectinolytic enzyme, which is of 45 mL. For the last set, 180 mL wastewater sample was again added into five portions of 250-mL Erlenmeyer flask each, followed by 50% (v/v) pectinolytic enzyme, which is of 90 mL. All the samples were incubated at 30 °C at 150 rpm in the IKA KS 4000i control incubator shaker. Each of the samples was withdrawn from the shaker incubator at regular intervals of 48 h for BOD5 analysis and oil and grease analysis. All the experiments were carried out in triplicates for results integrity and accuracy. Figure 1 shows the samples prepared and ready for incubating. Ten liters of kitchen greywater was collected using amber glass container (APHA 2005). The sampling equipment used was beaker and glass container. All sampling equipment was cleaned and dried before use, ensuring free contaminants. The sample was sent to the laboratory upon collection and preserved under 4 °C in the cold room. The wastewater was then filtered using filter cloth to remove large solid particles prior for analytical procedure. A café serves Western breakfast, and lunch was chosen as the wastewater sampling point. The peak hour of the business is between 0800 and 1400 h. The wastewater produced from food preparation (i.e., meat/vegetables washing), leftovers of wastes (i.e., oily flavoring and baking ingredients) and cleaning activities (i.e., dish washing and kitchen cleaning) was sampled. The flow rate was measured by using flow meter (Gardena, UK). During normal business hour, the kitchen discharge was about 1 m3/h of untreated wastewater that carries significant oil and grease with high loading of total suspended solids (TSS). Prior entering the surface water, an oil trap was installed which serves as oil and grease entrapment. Manual removal of lump and scum was done periodically to maintain good water flowing into the surface drain as can be observed from visual observation (Data not shown nor discussed). where D1 = DO of diluted sample immediately after preparation, mg/L, D2 = DO of diluted sample after 5-day incubation at 20 °C, mg/L and P = decimal volumetric fraction of sample used. where Mi = initial BOD5 concentration, mg/L and Mf = final BOD5 concentration, mg/L. where A = weight of distilling flask with residue, mg and B = weight of distilling flask, mg. The fermented pectinolytic enzyme solution obtained was centrifuged for 30 min with 3000 rpm (Sorvall Legend Micro, Fisher Thermo Scientific, USA). The supernatant was separated and further used as working enzyme sample throughout the experimental work. 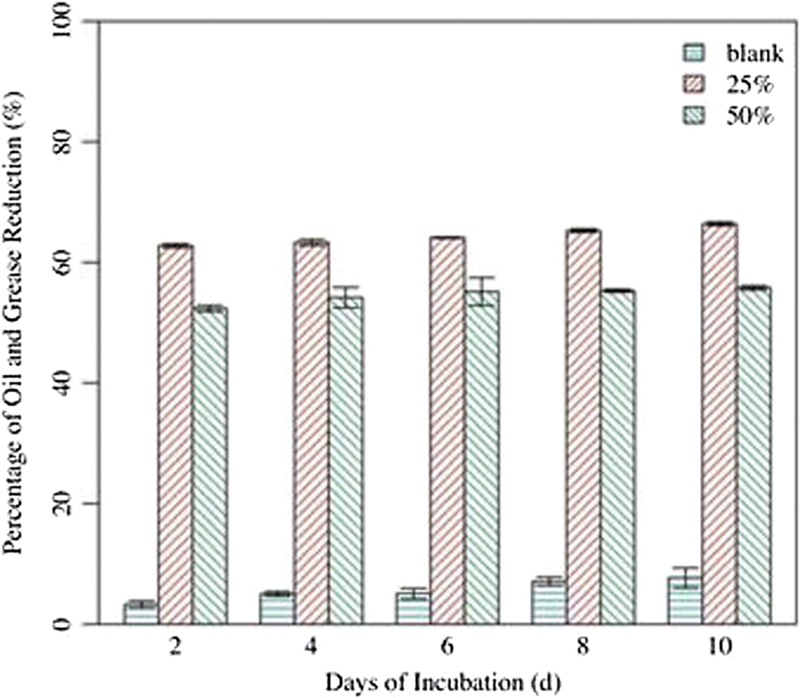 The characteristics of pectinolytic enzyme solution obtained after 90 days of fermentation were analyzed, and its characteristics are shown in Table 3. From the table, it could be deduced that, during fermentation period, carbohydrates were converted into volatile acids with the presence of organic acids as a result of decomposition of citrus and Musa acuminata peels. The fermented wastes were leached out into fermented solution since the pH of pectinolytic enzyme was acidic in nature. The result was in agreement with the work done by Nazim and Meera (2013) which synthesized garbage enzyme by using simple fermentation of fresh vegetable waste, brown sugar and water for 60 days. They reported TDS as 1120 mg/L, BOD as 92.6 mg/L and COD as 186 mg/L. In this work, fermentation was conducted for 90 days by using molasses instead of the jaggery (brown sugar). The result obtained showed that the pH of 4.6 and BOD5 as 68 mg/L and of the pectinolytic enzyme solutions were much lesser than results reported by Nazim and Meera (2013). The plausible phenomenon may be explained due to the microbes present in the molasses which expedite complex organic matter decomposition in the presence of organic waste. In another work, Arun and Sivashanmugam (2015) reported pH and BOD5 of 3.6 and 79 mg/L, respectively, when using molasses (waste product from sugar factory). Pectinolytic enzymes at various pH (4.6, 6, 6.5, 7, 7.5, 8) were used to examine lipase activity. The range of pH for the study was chosen based on the work proposed by Arun and Sivashanmugam (2015). It was observed that maximum lipase activity was recorded at pH 8 and reduced sharply when pH was increased from 8 to 13 and in agreement with the work done by Shu et al. (2006) and Arun and Sivashanmugam (2015). For this research, lipase activities were evaluated by using corn oil as substrate and the results are illustrated in Fig. 2. Interestingly, the lipase activity was found increasing from pH 4.6 to 8 indicating the lipolytic of the enzyme could be attained by maintaining the pH of the solution in the ranges of 7 and 8. This finding also conformed to the work done by Hoondal et al. (2002). They observed that vegetable food processing wastes released pectin, containing wastewaters as by-product. In fact, treatment of this wastewater with the presence of pectinolytic enzymes improved the removal of pectinaceous material and makes it suitable for decomposition of organics. 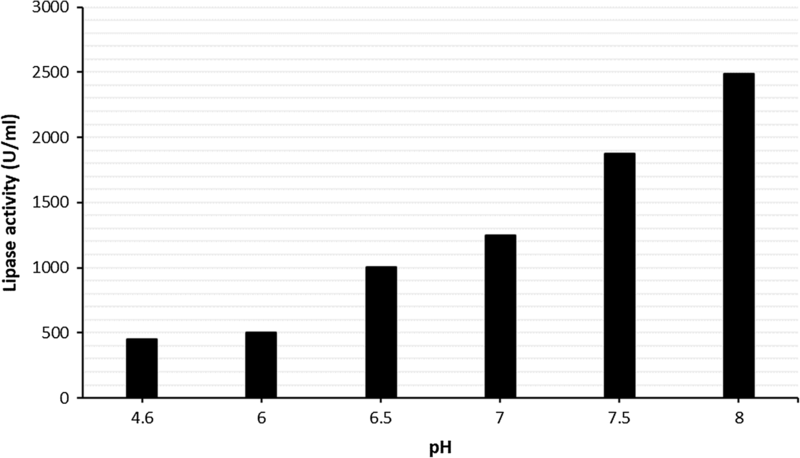 The physical and chemical parameters considered in the wastewater quality analysis of in this work were pH, biochemical oxygen demand (BOD5) and oil and grease. Table 4 lists down the result of the analyzed raw kitchen greywater. Typically, the raw kitchen greywater was acidic in nature with a pH value of 4.42 ± 0.03. The microorganisms were fermenting the nutrients present in the kitchen greywater, producing some organic acids, such as acetic acid and butyric acid. Therefore, the kitchen greywater was acidic (Zhao et al. 2017). On the other hand, the BOD5 of the wastewater was 132.20 ± 0.60 mg/L. A BOD5 test measures the strength of the wastewater based on the amount of oxygen required to stabilize the organic material in the wastewater. Generally, wastewater comprised inorganic and organic substances. Organic substances are referred to as carbon-based molecules; these include detergents, soaps, fats, greases and food particles. Oxygen is required for the bacteria to decompose these molecules into carbon dioxide and water (Abubakar et al. 2016). Further, the concentration of oil and grease in the raw wastewater was 843.53 ± 4.76 mg/L. As the café serves Western breakfast and lunch, the result showed a good compatibility with the data reported in previous study (Chen et al. 2000) which range the oil and grease concentration between 52.6 and 2100 mg/L for a restaurant that serves Western cuisine. The dissolved oxygen (DO) has a direct relationship with the biochemical oxygen demand (BOD5) as it serves as the basis to test the concentration of BOD5 of the water sample, especially that of wastewater where microorganisms and food supply (which is the organic matter) are present in the water body. The dissolved oxygen is consumed by the microorganism in the process of oxidation or degradation of waste in the water body. Furthermore, water body that contains high concentration of organic matter leads to low concentration of dissolved oxygen due to the increase in microbial activity such as respiration upon decomposition of organic matter (Chapman 1996). Dissolved oxygen uptake which is part of the calculation for BOD5 can be explained as the difference between the initial dissolved oxygen of the wastewater sample and the dissolved oxygen of the water body after the 5-day incubation period. When all the organic matter in the wastewater has degraded, the microorganisms no longer have food to consume on. As a result, the oxidation rate decreases, leading to the reduction in dissolved oxygen uptake (Poey 2011). In the present study, the initial dissolved oxygen (DO) concentration uptake of the raw kitchen greywater was 6.61 ± 0.03 mg/L. Table 6 shows the concentration of dissolved oxygen uptake for raw and treated kitchen greywater recorded at each analysis interval. Figure 3 shows the biochemical oxygen demand (BOD5) concentration for raw kitchen greywater and kitchen greywater treated with pectinolytic enzyme at different concentrations. The concentration of BOD5 for the raw kitchen greywater was 132.20 ± 0.60 mg/L. But, it reduced to 114.73 ± 0.83 mg/L, 94.93 1.30 mg/L, 84.53 ± 0.95 mg/L, 82.13 ± 1.17 mg/L and 79.40 ± 0.87 mg/L on the second, fourth, sixth, eighth and tenth day of incubation. However, the BOD5 concentration of samples treated with 25% (v/v) pectinolytic enzyme decreased to 96.80 ± 0.92 mg/L, 84.00 ± 0.92 mg/L, 84.00 ± 0.35 mg/L, 66.67 ± 0.76 mg/L and 66.27 ± 0.46 mg/L on the second, fourth, sixth, eighth and tenth day of treatment. On the other hand, the BOD5 concentration of kitchen greywater treated with 50% (v/v) pectinolytic enzyme decreased gradually to 124.00 ± 1.11 mg/L, 98.33 ± 1.50 mg/L, 85.73 ± 1.42 mg/L, 79.13 ± 2.08 mg/L and 69.3 ± 0.61 mg/L on the second, fourth, sixth, eighth and tenth day of treatment. 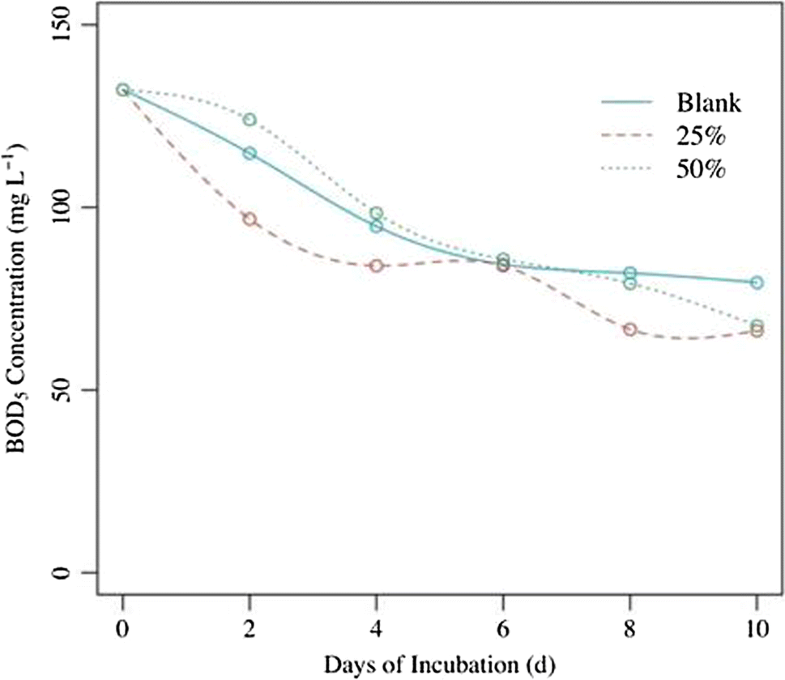 From the results, the BOD5 concentration of the control, which is solely raw kitchen greywater, experienced reduction during the 10-day incubation. This trend was found comparable to previous studies where the BOD5 concentration of wastewater sample without treatment experienced reduction during the digestion period as well (Tan and Tong 2011; Nazim and Meera 2013). During the incubation period, the microorganisms in the wastewater degraded the organic matter, and thus, the BOD5 concentration decreased. 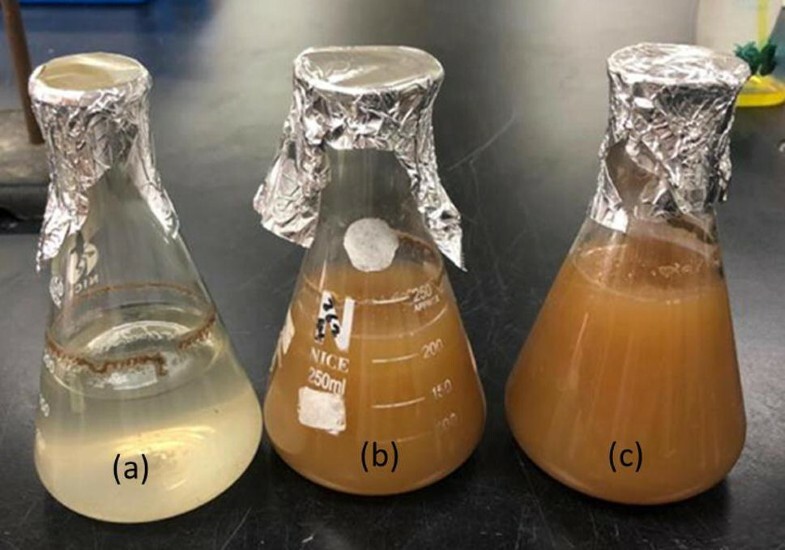 The microorganisms were suspended in wastewater (known as activated sludge) and attached to the surfaces of the Erlenmeyer flask forming a biofilm (Ibanez et al. 2010). 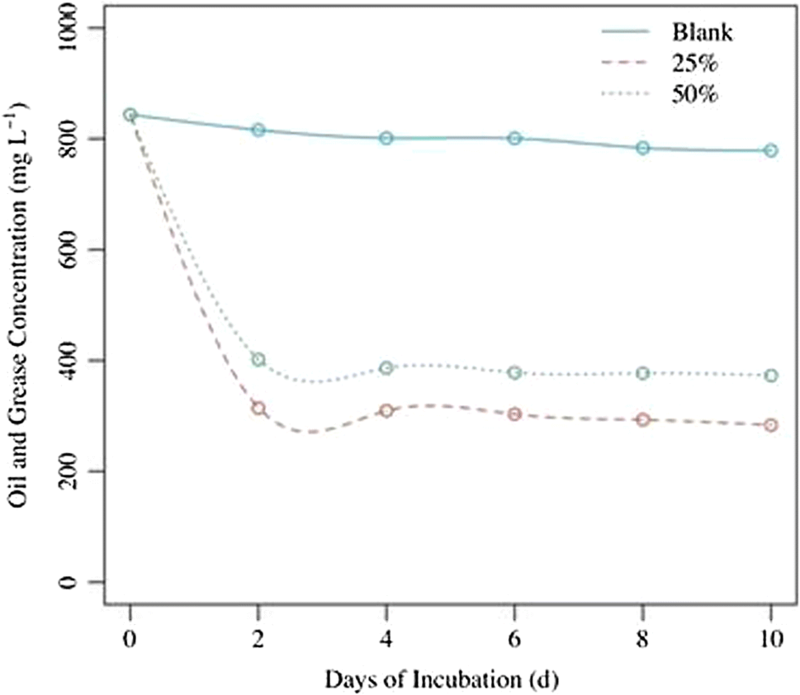 Figure 4 compares the BOD concentrations against incubation days. It is evident that although the BOD5 concentration of the wastewater decreased without pectinolytic enzyme treatment, the percentage of BOD5 concentration reduction was higher with the application of the enzyme. Furthermore, the maximum BOD5 concentration reduction was achieved by wastewater sample treated with 25% (v/v) pectinolytic enzyme. The percentages of removals for wastewater sample treated with 25% (v/v) garbage enzyme were 26.77 ± 0.94%, 36.46 ± 0.66%, 36.46 ± 0.15%, 49.57 ± 0.79% and 49.87 ± 0.42% on the second, fourth, sixth, eighth and tenth day of treatment. However, the mixture of wastewater with 50% (v/v) pectinolytic enzyme did not reduce the BOD5 concentration of wastewater as ideal as the application of 25% (v/v) pectinolytic enzyme. Moreover, the percentage of BOD5 reduction was lesser than that of the control sample from day 0 to day 6. This is due to the high amount of organic matter present in the pectinolytic enzyme itself. According to the study by Tan and Tong (2011) which found that the addition of the garbage enzyme in the wastewater treatment increased the BOD5 concentration of the mixture due to the increment of organic matter in the sample as garbage enzyme was produced from organic waste and brown sugar as the fermentation substrate. Thus, in this case, the application of 25% (v/v) pectinolytic enzyme is the ideal dosage not only to provide sufficient microorganism for degrading the organic materials in the kitchen greywater but also not increasing the organic matter in the wastewater sample. An independent-samples t test was conducted by using R to compare the BOD5 concentration reduction in wastewater sample treated with 25% (v/v) garbage enzyme and the wastewater sample treated with 50% (v/v) garbage enzyme. The result shows that it is close to being statistically significantly different in the percentage of BOD5 concentration reduction in sample treated with 25% (v/v) pectinolytic enzyme (M = 39.83, SD = 9.15) and sample treated with 50% (v/v) pectinolytic enzyme (M = 30.94, SD = 14.82); t(28) = 1.98, p = 0.058. These results suggested that there is a difference in the BOD5 concentration reduction between the kitchen greywater samples that were treated with different concentrations of garbage enzyme. Specifically, the result showed that 25% (v/v) pectinolytic enzyme reduced BOD5 concentration of wastewater sample significantly better than 50% (v/v) pectinolytic enzyme did. Figure 5 shows the oil and grease concentration for the control sample and wastewater samples treated with different concentrations of pectinolytic enzyme. As mentioned in Table 4, the initial oil and grease concentration of the raw kitchen greywater was 843.53 ± 4.76 mg/L. It is seen in the figure that the oil and grease concentration of wastewater samples treated with pectinolytic enzyme reduced drastically on day 2. The concentration was reduced to 313.92 ± 3.02 mg/L and 401.57 ± 4.34 mg/L for samples treated with 25% (v/v) pectinolytic enzyme and 50% (v/v) pectinolytic enzyme, respectively. In other words, addition of 25% (v/v) garbage enzyme and 50% (v/v) garbage enzyme in the raw kitchen greywater had successfully reduced the oil and grease concentration by 62.78 ± 0.36% and 52.39 ± 0.51%, respectively. These results showed evidence of the ability of the garbage enzyme in removing oil and grease from kitchen greywater. However, no further reduction was observed since day 2 until the end of the incubation period in both sets of treatment samples; thus, the oil and grease concentration remained constant for both treatments. Generally, the rate of an enzymatic reaction depends on the concentrations of enzyme and substrate (Robinson 2015). The rate of reaction increases as the concentration of either of the elements is increased. For a given enzyme concentration, the rate of enzymatic reaction increases along with the substrate concentration up to the point of saturation, where further increase in substrate concentration makes no change in the reaction rate. This can be explained by the fact that the active sites of the enzyme at any given moment are saturated with the substrate, no free slots to accommodate more substrate. Although the active sites of the enzyme will be free to catalyze more substrate after the dissociation of enzyme/substrate complex, the bio-catalytic activity of enzyme was observed to reduce or even stop after day 2 in this study. This might due to the inhibition of enzyme activity caused by inhibitors that inhibit reactions. They can either be active site-directed or non-active directed. Figure 6 compares removal percentage of oil and grease removal for raw and treated kitchen greywater. The figure implies that the oil and grease removal was 10% higher for wastewater sample treated with 25% (v/v) pectinolytic enzyme when compared to that for sample mixed with 50% (v/v) pectinolytic enzyme. This can be explained with the fact that pectinolytic enzyme, which is an enzyme, works best at its optimum condition (Poey 2011). The enzyme reactions can be affected by various factors, and one of them is the pH value. According to the Textbook of Medical Biochemistry, pH value affected the rate of enzyme reactions considerably. This is due to several factors such as primary ionization of the enzyme, influencing the formation of the enzyme–substrate complex, co-factors and more. Every enzyme has its optimum pH at which it functions effectively. On either side of this optimum pH, the rate of enzyme reaction will be reduced. Small changes in pH value can lead to reversible changes in the ionization pattern of amino acids of active site. In the present study, the increase in the concentration of pectinolytic enzyme decreased the pH value of the mixture of wastewater samples and pectinolytic enzyme. This is due to the nature of pectinolytic enzyme, which exhibits acidic property. From the results obtained in this project, the pH value of wastewater sample added with 25% (v/v) pectinolytic enzyme was 4.09 ± 0.12, while that of sample treated with 50% (v/v) pectinolytic enzyme was 3.04 ± 0.05. 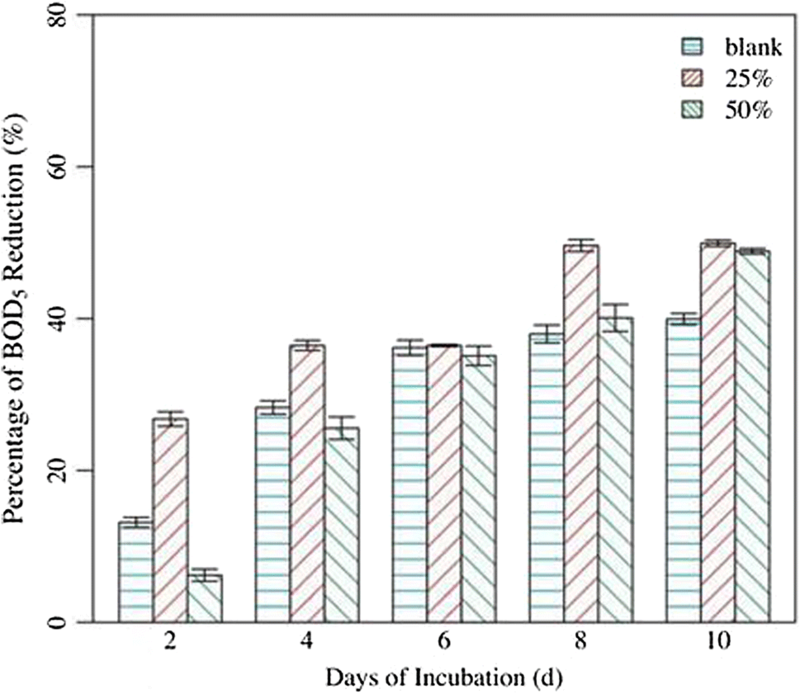 From the previous study carried out on the determination of bio-catalytic activity in garbage enzyme solution by Arun and Sivashanmugam (2015), they investigated the lipase activity of the garbage enzyme with various pH values. The results revealed that the lipase activity increased gradually from pH 3.6 to 8. Hence, the higher percentage of oil and grease removal indicated that 25% (v/v) pectinolytic enzyme concentration was a better concentration for ideal result in degrading oil and grease compared to the more concentrated garbage enzyme which was expected to reduce more oil and grease (Vasudevan et al. 2013). An independent-samples t-test was conducted by using R to compare the oil and grease concentration reduction in wastewater sample treated with 25% (v/v) pectinolytic enzyme and the wastewater sample treated with 50% (v/v) pectinolytic enzyme. There was a significant difference in the percentage of oil and grease removal for sample treated with 25% (v/v) pectinolytic enzyme (M = 64.21, SD = 1.17) and sample treated with 50% (v/v) pectinolytic enzyme (M = 54.57, SD = 1.67); t(28) = 18.33, p < 2.2e−16. These results suggest that there is a difference in the percentage of oil and grease reduction between the kitchen greywater samples that were treated with different concentrations of pectinolytic enzyme. Specifically, the result showed that 25% (v/v) pectinolytic enzyme remove oil and grease from wastewater sample significantly better than 50% (v/v) pectinolytic enzyme did. Experimental data obtained show that pectinolytic enzyme can remove biochemical oxygen demand (BOD5) and oil and grease from kitchen greywater collected from a local café that serves western cuisine. The maximum percentage of BOD5 reduction achieved in this project was 49.87 ± 0.42% and 47.60 ± 0.36% for wastewater samples treated with 25% (v/v) pectinolytic enzyme and 50% (v/v) pectinolytic enzyme, respectively. As for the oil and grease analysis, the maximum percentages of reduction were 65.64 ± 0.33% and 55.79 ± 0.35% for wastewater samples added with 25% (v/v) pectinolytic enzyme and 50% (v/v) pectinolytic enzyme, respectively. It is evident from the results that 25% (v/v) pectinolytic enzyme is a better dosage for treating the kitchen greywater when compared to 50% (v/v) pectinolytic enzyme. Results of this project demonstrated the potential of pectinolytic enzyme in removing organic matters from the kitchen greywater as well as an alternative that is inexpensive and requires less expertise to operate. However, pectinolytic enzyme is not an ideal solution in removing BOD5 as the medium itself contains organic matter that increases the total organic matter in the mixture. Authors gratefully acknowledge the Grants received from Universiti Sains Malaysia under Short-Term Scheme—Research University Grant (304)/PTEKIND/6315062), that enable this work to be carried out successfully.